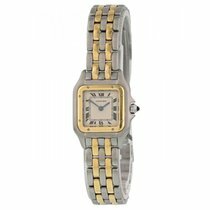 Details Cartier Panthere 1280 2 Ladies Watch. 18K Yellow Gold diamond case and bezel. Champagne dial with gold hands diamond hour markers. All diamonds are factory placed. 18K yellow gold bracelet with butterfly clasp. Will fit up to a 6.5-inch wrist. Sapphire crystal. Quartz battery powered movement. This watch is backed by our one year warranty.